Silk amino acids (SAA) originate from silk proteins produced from silkworm and have been ingested as part of the diet in Asian countries for a long time1. Where Do Silk Amino Acids Come From? Two proteins called fibroin and sericin are the main constituents of silk, with fibroin constituting 70-80% and sericin 20-30% of the total cocoon weight. Fibroin is the structural component of silk, while sericin acts like a glue that holds the fibroin threads together2, 3. Basic hydrolysis of silk proteins results in the generation of a series of silk peptides that are 18-19 amino acids in length. However specific enzymatic degradation of these peptides yields various shorter-chain silk peptides, which have been shown to exert diverse bioactivities such as anti-diabetic, hypocholesterolemic, anti-oxidant, immune-regulatory, anti-tumor, anti-viral and anti-bacterial effects4. When examining the benefits of supplementation with SAA, it’s important to distinguish between the different types of SAA supplements. The term SAA is often used interchangeably with silk proteins and/or silk peptides and many studies are vague concerning specifics of whether the amino acids occur in singular, peptide or protein form. Concerning the specific performance-enhancing effects of SAA, a group of researchers from Korea have published a series of positive studies in rodent models, where a silk peptide mixture with the following amino acid composition has been used. This particular mixture contains amino acids predominantly in dipeptide form, which is an important distinction as amino acids in this form have been shown to have superior absorption and uptake characteristics. Using this SAA peptide hydrolysate mixture, the research group from Korea found that repeated treatment with the SAA preparation resulted in lowered blood levels of tissue injury parameters from the muscles and the liver. It also lead to increased glucose and albumin levels and improved lymphocyte counts5 . Yet another study where mice received a daily dose of 800mg/kg showed stamina-enhancing activity during forced swimming by preventing tissue injuries and increasing anti-fatigue parameters6. While the results of these studies in rodents have been impressive, the only study to date in humans has not yielded as positive results. Polish researchers gave elite male swimmers 500mg of SAA per kg of body mass 3 times a day, 30 minutes prior to training for 12 days. Compared with the control group, the experimental group showed better lactate profiles as well as a small increase in serum testosterone. However, an interesting observation was that these changes were associated with an increase level of muscular damage7. It is not clear exactly how the beneficial effects of SAA are mediated, particularly given its unique amino acid composition made up primarily of: alanine, glycine, serine, valine and threonine. However some have postulated that the oxidation of amino acids occurs primarily in the liver and the main amino acid playing the paramount role in its physiological function is alanine –through its conversion to beta-alanine8. To date no negative side effects have been found in animal or human studies using SAA. Successful studies have used between 500mg/kg and 800mg/kg bodyweight per day. This is more than the typical dose prescribed on any given supplement containing SAAs. Currently there are very few stand alone SAA supplements available. 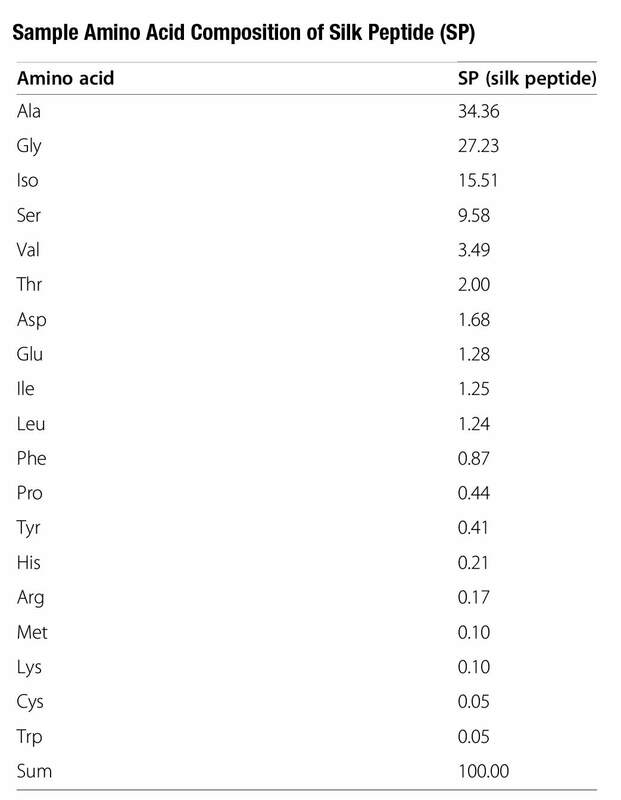 Most feature SAA as part of a mix of other nutrients. What’s more, many supplements simply include the amino acids alanine, glycine, serine, valine and threonine, rather than the whole silk amino acid hydrolysate used in many of the published studies. SAA supplements may be combined with most other popular supplements such as branched-chain amino acid based intra workouts and pre workouts as there is little overlap in terms of ingredients. Lee SH, et al. Silk and silkworm pupa peptides suppress adipogenesis in preadipocytes and fat accumulation in rats fed a high-fat diet. Eur J Nutr. 2012;51(8):1011-9. Martínez-Mora C, et al. Fibroin and sericin from Bombyx mori silk stimulate cell migration through upregulation and phosphorylation of c-Jun. PLoS One. 2012;7(7):e42271. Kato N, et al. Silk protein, sericin, inhibits lipid peroxidation and tyrosinase activity. Biosci Biotechnol Biochem. 1998;62(1):145-7. Shin S, et al. Silk amino acids improve physical stamina and male reproductive function of mice. Biological and Pharmaceutical Bulletin. 2010;33(2):273—278. Shin S, et al. Stamina-enhancing effects of silk amino acid preparations in mice. Lab Anim Res. 2009; 25:127–134. Shin S, et al. Silk amino acids improve physical stamina and male reproductive function of mice. Biol Pharm Bull. 2010;33:273–278. Zubrzycki IZ, et al. Supplementation with silk amino acids improves physiological parameters defining stamina in elite fin-swimmers. Journal of the International Society of Sports Nutrition. 2014;11:57. Harris RC, Sale C: Beta-alanine supplementation in high-intensity exercise. Med Sport Sci 2012, 59:1–17.